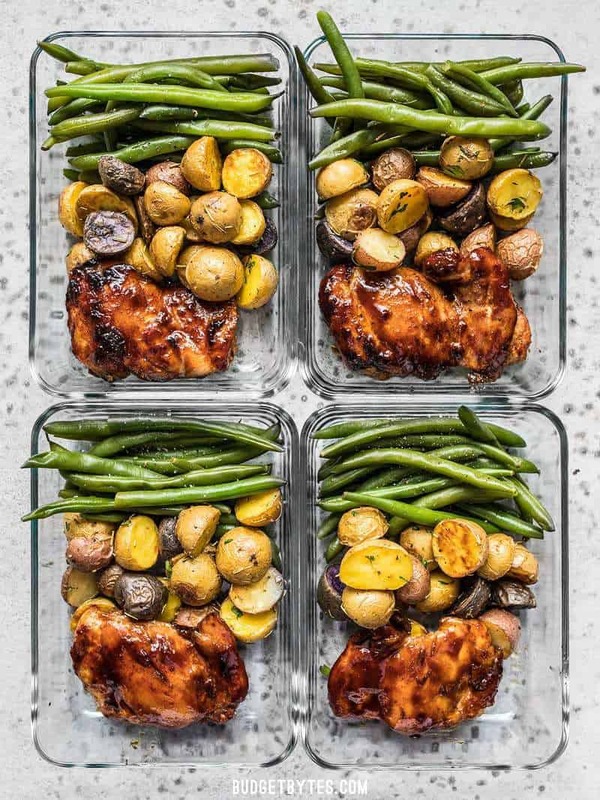 Okay guys, I’m putting it all together today with this Glazed Chicken Meal Prep! I went out of town for a couple of days for Labor Day weekend, and even after just a few days of eating out I couldn’t wait to get home and make some simple good food. 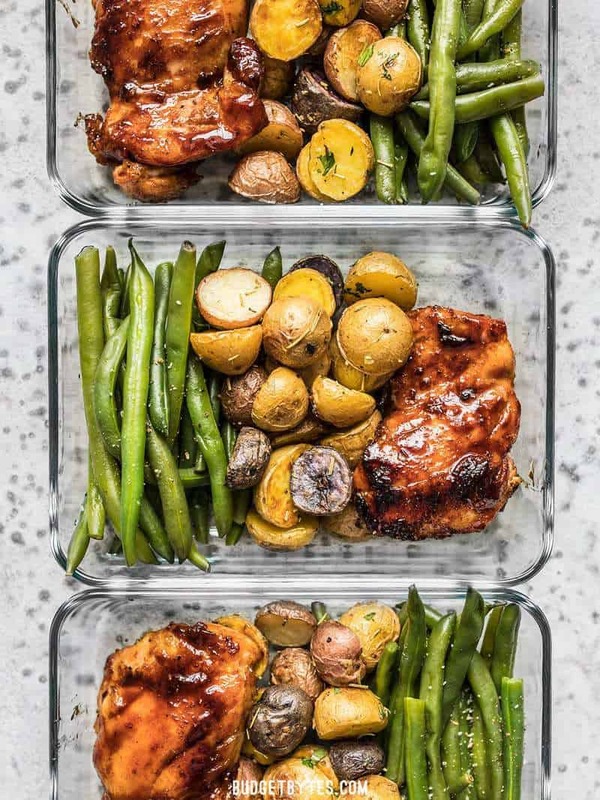 I made three super easy recipes this week, Sweet and Spicy Glazed Chicken Thighs, Rosemary Roasted Potatoes, and steamed green beans, all of which reheat beautifully. And that’s my favorite kind of meal prep. Simple, good, no-fuss. I do not have a recipe post for the green beans because I just steamed them without adding anything, which isn’t really a “recipe.” To steam the beans, place about one inch of water in the bottom of a sauce pot, place a steaming basket inside, then add your green beans. Place a lid on top, turn the heat on to high, and let the water boil to steam the green beans. The beans are finished when they are bright green and slightly tender. Remove them from the heat, pack them in your containers, and refrigerate. If you do not have a steamer basket, you can still steam your green beans. Follow the instructions listed in my recipe for Lemon Butter Green Beans. You can use chicken breasts instead of thighs for a leaner lunch box, just make sure to pound out your chicken breasts to an even 1/2-inch thickness before cooking to ensure that they cook quickly and evenly. Not a fan of glazed chicken thighs? Check out my list of other ways to prepare chicken thighs. I think Herb Butter Chicken Thighs or 20 Minute Honey Mustard Chicken Thighs would also work beautifully with these sides. Swap out the green beans for any green vegetable, like broccoli florets, sautéed zucchini, or maybe even some sautéed kale. Just about any herb or spice blend can be used on the roasted potatoes. Or, you can even swap out the roasted potatoes for a mashed potato. How Long Does This Meal Prep Last? There are a lot of variables that can impact how long food lasts in the refrigerator, but I generally keep a meal prep box like this for four days. Anything longer than that and I find that the quality really goes downhill and I will not want to eat it. This particular box probably would not freeze very well, so I would stick to refrigeration. 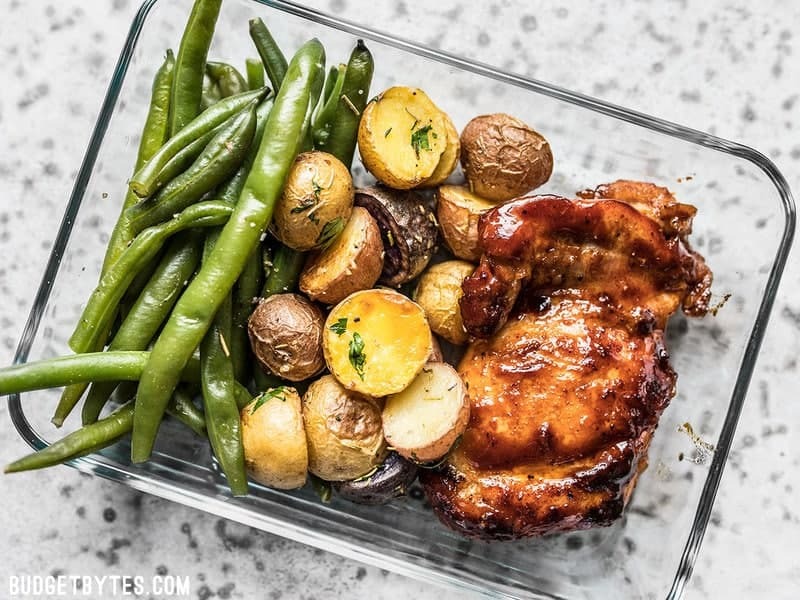 The post Glazed Chicken Meal Prep appeared first on Budget Bytes.